I'm an IT department of one at home. It's difficult to get useful IDS tools working on your network, which is better than it used to be. Attacks are more sophisticated and easier to execute than ever. I've been experimenting with Suricata IDS and I want to see threats in a maximally useful way. Snorby is a Ruby on Rails based web application that can analyze your IDS logs and give you visibility into your network. Protection is the sum of prevention, detection and response. Log files are not detection. Snorby has a setup guide on it's website but I thought I'd make one specific to Ubuntu 14.04. There's a blog with instructions for 12.04 that will break in 14.04, as my students found out. The key difference between the "vanilla" Snorby installation and this procedure is that I want to use Ubuntu's packaged versions of as many things as possible. I love the way Ruby bundles dependencies and compiles a standalone environment. Any sane admin would sacrifice disk space to reduce system interdependencies. I'm just seeing what I can get away with. Now build. This process can be done entirely as a non-root user, therefore it should be. No excuses. "Jammit Warning: Asset compression disabled -- Java unavailable." I'm ignoring it based on reading this thread. Add a snorby user to the database. Don't fail to change the name and password. What's next? Snorby's site has instructions on how to start it. After that you have to integrate the output of Suricata. Here's a postcard from the Embedded Linux Conference. The clear winners of this year are the Internet of Things (IoT) and drones. There was one talk about UAVs last year and this year they have an entire track. That's something of a 20x increase in talks on the subject. Some goes for IoT which in addition to its own track also scored two of the keynote talks. One thing that really struck me is how much needs to be done in IoT. Panasonic announced that they are open-sourcing their existing software stack. Intel is headlining their efforts in the Open Interconnect Consortium which includes Cisco as a diamond member (the highest category). Everyone is happy to announce how many people are on board but during the panel discussion the emphasis was on interoperability. Something tells me Apple Homekit will start with a huge advantage: Interoperability guaranteed. Intel presented an interesting talk about IoT security but today that is more concept than implementation. I want my CIS-192 class to have access to public IP addresses for their projects. Unfortunately, there's just not enough IPv4 addresses for everyone. Rick setup prefix delegation on our router at school and I figured out how to integrate DHCP-PD and RA on Ubuntu. I based my efforts on the how-to here, but my network setup is quite different. eth1: (Internal Interface) Generated by DHCP-PD from eth0. It also determines whether or not to transmit Router Solicitations. If and only if the functional setting is to accept Router Advertisements, Router Solicitations will be transmitted. 2 Overrule forwarding behaviour. Accept Router Advertisements even if forwarding is enabled. Functional default: enabled if local forwarding is disabled. disabled if local forwarding is enabled. Apt has a configuration script that asks what interface the DHCP client should use for performing DHCP. Be sure to set the interface that's facing the DCHP server (that's eth0 for me). The WIDE DHCP client needs to be told to ask for a prefix. In my case that's all it asks for. Astute observers will note that it's not possible to assign networks with a mask greater than 64. This means that if your DCHP server delegates /64 addresses (like mine does) you do not have any bits left for your sla-id so you must set sla-len to 0. If you don't set sla-len correctly the DHCP client silently fails. Grrr. Anytime the lease is renewed radvd will reload it's configuration files. This is probably close to what you want. The radvd.conf option DecrementLifetimes should probably be set to on. That is what you're supposed to do when you receive a prefix from DHCP. I haven't tried that option yet. I made a pecan pie for Pi day. 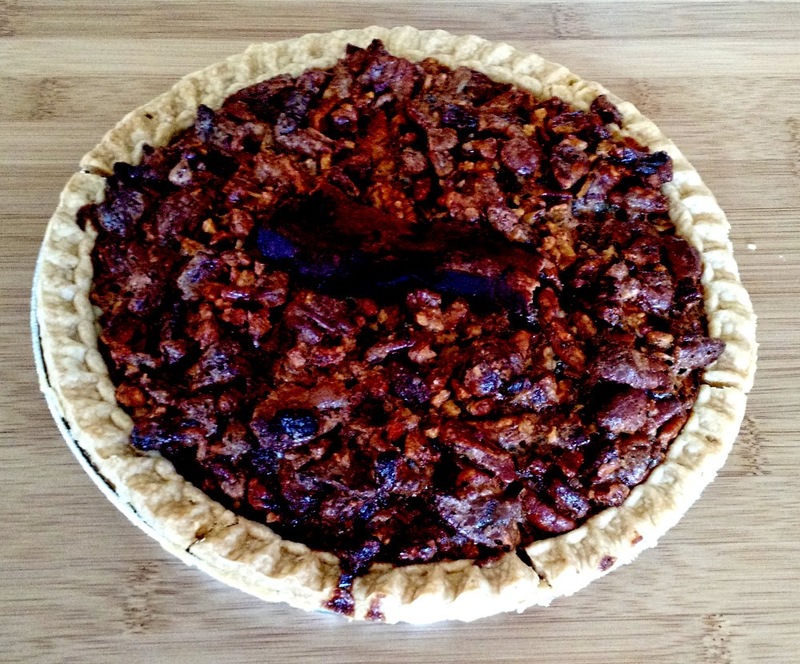 I love pecans but I've never liked pecan pie because the overly sweet goo is such a put-off. Corn syrup is much cheaper than pecans so I guess you get what you pay for. My pies turned out right on the edge of sweet and savory. I loved them. Here's my recipe. Fry the bacon until it's crisp. Cut three strips into bits and save one for garnish. In a saucepan combine the sugar and syrup with two table spoons of bacon grease and heat until the sugar is dissolved. Stir smashed pecans and bacon bits into the syrup mixture and allow it to cool somewhat then stir in the beaten eggs. I baked mine in two prefab pie crusts at 400 degrees for 40 minutes.